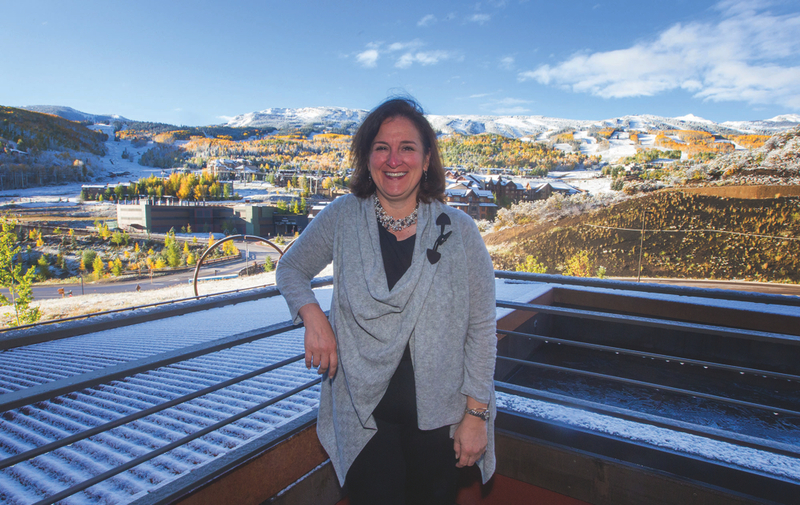 Rose Abello, the director of Snowmass Tourism. SNOWMASS VILLAGE – As the spokeswoman for Aspen Skiing Co. under president Pat O’Donnell’s regime in the late 1990s and early aughts, Rose Abello was known for her disciplined messaging. Rarely, if ever, did she deviate from the company line. After a 14-year absence from the valley spotlight, a decidedly more relaxed Abello has assumed the reins of Snowmass Tourism, a job where she oversees marketing and group sales for this publicly funded department within the town of Snowmass Village. “I’m the same person really, I don’t think I’ve changed that much but I think we all evolve. As a boss and leader, you try to create more opportunities for people to thrive. It really does take all kinds of people to make things happen,” she said this week. Abello, 49, is part of a new wave of department heads in the town. “I’m two weeks behind the town manager,” she said of Clint Kinney, who recently arrived from Fruita. In July, long-time officer Brian Olson was installed as the new police chief and in March of this year, Julie Ann Woods was hired as the community development director. The daughter of Cuban immigrants, Abello earned her undergraduate degree from Wellesley College and a master’s in marketing and international business from the University of Michigan. Passionate about traveling, Abello has visited every continent but Antarctica. Last year she hiked the Camino de Santiago, starting in the south of France and finishing 35 days later in western Spain. She also loves to ski and snowboard, and one season not long ago, recorded 134 days on the slopes. For the last five years, she has lived in Aspen during the winters, working as a marketing consultant. On her fourth day as director of Snowmass Tourism, Abello spoke with Aspen Journalism about marketing, lessons learned from a multi-billion dollar corporation and why she swapped job flexibility for the rigors of management. AJ: You averaged more than 100 days on the slopes each of these past five years while enjoying the flexible schedule of a consultant (one of her local clients was Ecoe marketing). Other than the annual salary ($128,717) and the housing benefit (the director position comes with a free condo in Snowmass Village), what’s so great about this job? RA: I guess it’s the Ute curse! Since I moved here in 1997, I’ve been in love with this community. I left for another job in 2001 but I tried to get back as often as I can. When I decided to leave my previous job, I figured out how I could spend a great deal of time here. I really thought that this would be a great opportunity to come back to this community full-time. That was one of the driving factors of taking this job. Snowmass Tourism has a terrific team and also a smart and engaged board. I’ve never worked in government so this was a chance to grow and learn. AJ: How has the industry changed since you left Aspen Skiing Co. 14 years ago? RA: What Snowmass looks like today as compared to 2001 is significantly different. From a marketing perspective, I think technology has changed the way you market. Traditional print is less important. You have to have a presence in more places. The platforms have changed. It’s exciting! There’s still a place for smart, impactful marketing. AJ: You worked at Holland America Line (which is owned by Carnival Corporation) after leaving SkiCo. What lessons learned from the cruise industry can you bring to Snowmass Tourism? RA: Working at a large corporation, it’s a machine. You operate 24/7, 365 days a year on seven continents. The interesting things are the discipline, the metrics and how data driven it is in so many components. They use that information to make smarter and more targeted marketing decisions. What I learned from working for a multi-billion corporation was to bring this disciplined and data-driven approach to whatever you do. I think the people in this department have done an incredible job of moving the needle. This summer’s line-up of events were well received and attended. And it really does take a village. Not just the tourism department but police, planning, finance, transportation — every department in this town had to pull together to get these events off. In terms of untapped markets, I think you’re going to see a focus from the sales team of filling in Monday through Thursday. Who that is and what the market is, I can’t say. There are some kinds of businesses that make sense for this outdoor community. AJ: While there’s a moratorium on marijuana dispensaries in Snowmass Village until 2017, pot tourism is a growing industry in Colorado. What is Snowmass Tourism’s stance on this issue? RA: My opinion is this community, like so many others, is going to see how the federal versus state law is going to play out. I don’t think this is something Snowmass Tourism is going to tackle today. AJ: Because of two taxes dedicated to marketing and group sales (in November 2002, voters approved a 2.5 percent sales tax for the marketing and special events fund. In 2005, the electorate approved a 2.4 percent bed tax to attract group sales), Snowmass Tourism enjoys what is considered by outsiders to be a pretty fat budget. Estimated tax revenues for 2014 are $5.6 million. Now that you are director, do have that same perception? RA: The community decided on those taxes. I do know there is a lot to do to promote, market and attract visitors to these communities. I’m impressed with what the team has accomplished with not so much of a budget. The value of the economic impact brought in by visitors is very important to the wellness and quality of life enjoyed by everyone in this community. AJ: How do you envision Snowmass Tourism working with Aspen Skiing Co.? RA: SkiCo is one of the many entities that Snowmass Tourism works with in the community. Snowmass Tourism works with lodges, ACRA and big event partners. SkiCo is an important player and I have a great deal of respect for the company. There are a lot of relationships that exist between players on a number of levels. SkiCo is an integral player. So is Snowmass Tourism. In a lot of areas, our goals are perfectly aligned. At the same time, Snowmass Tourism will look out for programs that benefit the Snowmass community specifically. AJ: If Base Village gets underway next year, what kind of impact do you think heavy construction will have on special events? Should concessions be made to groups while construction is underway? RA: Nothing has been decided about Base Village, maybe on Monday (when council is expected to vote on second reading about a vesting extension). Nobody knows what “it” is yet. Whatever “it” is will have a comprehensive construction plan. An integral part of that is a comprehensive communications plan. From a sales and marketing perspective, Base Village is an important and vital part of the community but it’s only part of it. There’s a ton of Snowmass, lots of hotels, condos and beds, that won’t be impacted by whatever “it” is. At the end of the day, completing Base Village, the benefits probably outweigh the inconveniences. Once the schedule is published, we will work quickly and proactively. We’ll decide what triggers we need to pull and manage from a tourism perspective. Once they draw the sandbox, we’ll play in it. Editor’s note: Aspen Journalism and Aspen Daily News are collaborating on coverage of local governments. The Daily News published this story on Saturday, Oct. 4, 2014. Follow Madeleine Osberger on Twitter, @Madski99.